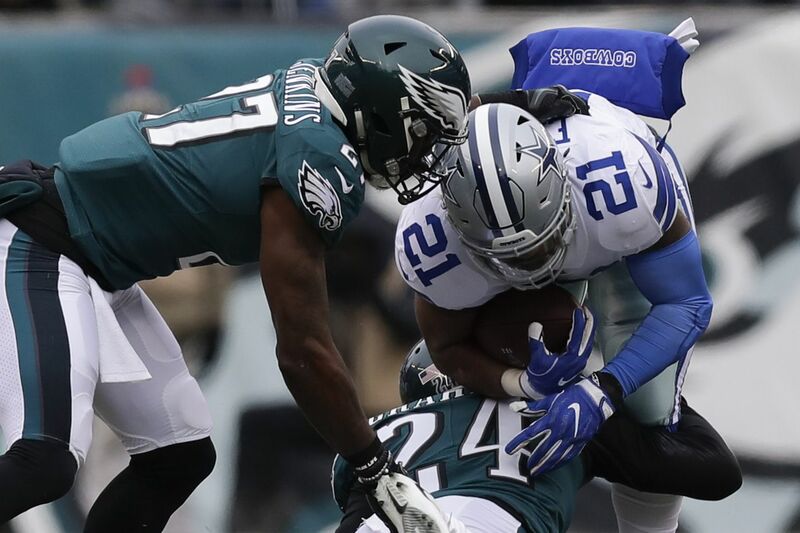 Eagles Corey Graham (bottom) and Malcolm Jenkins combining to stop Cowboys running back Ezekiel Elliott on Dec. 31, 2017. Suddenly, I'm hearing a lot of talk about a "gimme game," and that strikes me wrong. A 4-4 team that blew a 17-0 fourth-quarter lead in its most recent home outing does not have "gimme" games; Corey Clement made the same point in interviews Wednesday. What this is, given the Eagles' schedule the rest of the way, is a "must-win," if you ask me. "Must" in the sense that if you can't beat a reeling, flawed, 3-5 Dallas team at home, you're kidding yourself about playoff contention, regardless of how messed up the NFC East is. Lose this week, you certainly aren't going into New Orleans next week and winning. The Eagles ought to be able to get pressure on Dak Prescott. They ought to be able to get a lead and make Ezekiel Elliott less of a factor in the second half, as Tennessee did last week. I'm a little worried about Lane Johnson's effectiveness against a good Dallas front, if he tries to play with that MCL sprain, but surely the Eagles have considered giving him some help. I don't see Dallas scoring enough points, at the Linc, to get this done. But at the end of the third quarter against Carolina, I didn't see how the Eagles could lose, so who knows? Carson Wentz has put up 115-plus passer ratings in four straight games and has thrown 12 touchdown passes in the last five games, and now he's got Golden Tate to throw to in addition to Alshon Jeffery and Zach Ertz against a Cowboys defense that has lost its very best player, linebacker Sean Lee. The Cowboys will be without linebacker Sean Lee (right). If the Eagles can jump out to an early lead, they can take Ezekiel Elliott out of the game and force the Cowboys to throw the ball more than they prefer, and their front four can just tee off on Dak Prescott. But that's been easier said than done for Doug Pederson's offense this season. His 15-play scripts have been ineffective. The Eagles are near the bottom of the league in first-quarter scoring. The Cowboys are in disarray. They've lost three of their last four. They haven't won on the road yet this season. Their former quarterback, Hall of Famer Troy Aikman, has called for a complete overhaul of the franchise. The Eagles aren't exactly running on all cylinders. But they're in better shape than the Cowboys and they're at home and they're rested after the bye week. The Eagles are coming off a much-needed week off. The Cowboys will be playing on five days' rest after their Monday night loss to the Titans. Teams can be sluggish coming off the bye – see: Eagles last year vs. the Cowboys – but the extended break vs. Dallas' short turnaround should benefit the home team. Both teams will be either short players or playing with injured ones. Cornerbacks Jalen Mills and Sidney Jones are likely out, along with running back Darren Sproles, who suffered yet another setback with his hamstring. The Cowboys will be without, at least, linebacker Sean Lee. Guard Zach Martin is expected to play with a knee injury, a disadvantage vs. Eagles defensive tackle Fletcher Cox in the middle. But Eagles tackle Lane Johnson, who is expected to play despite a knee sprain, will be at less than 100 percent against premium edge rusher Demarcus Lawrence. Eagles tackle Lane Johnson is expected to play despite his injured knee. If the injuries are a wash, the Eagles should have the edge, particularly on defense. Dallas' run offense is potent with Ezekiel Elliott, but the Eagles have the No. 2 run defense. The Cowboys system lacks imagination, and Dak Prescott has suffered as a result. He's been sacked more than any other quarterback. Receiver Amari Cooper, acquired before the trade deadline, helped some last week, but it could take time for him to have a significant impact. Dallas' defense has played well overall, but the absence of Lee will hurt. Lawrence has 6 1/2 sacks. Cornerback Byron Jones has been playing at a shutdown level, but the Cowboys safeties, Xavier Woods and Jeff Heath, have been susceptible to the pass. The Eagles should be able to take advantage with tight end Zach Ertz. Newly acquired receiver Golden Tate will not have the full slate from the playbook, but he toasted the Cowboys when he was with the Lions in September (eight catches for 132 yards and two touchdowns) and should be able to exploit slot corner Anthony Brown. The Eagles returned from their bye last season for a prime-time game against Dallas, and after sleepwalking through the first half, they dominated the Cowboys. The Eagles were clearly the better team one year ago, and they're the better team this season, too. Although the Cowboys have a top-5 defense, their offense doesn't have enough creativity or firepower to beat the Eagles in Philadelphia on short rest. The Eagles always go into a game with the objective of stopping the run, and that's imperative this week. Amari Cooper can hurt the Eagles, but he'll get a lot of defensive attention. Who else is going to beat the Eagles? The Cowboys don't have enough players to threaten them elsewhere. Without Jalen Mills, Eagles fans will get to see Rasul Douglas log significant action. Rasul Douglas (right) should get a lot of defensive snaps Sunday night. The Eagles have been inconsistent on offense this season, but Carson Wentz is the better quarterback in this game and the addition of Golden Tate should help him even more. Losing Darren Sproles hurts, although they haven't had him since Week 1. They'll need to get by with their three-man committee, and I'd expect Josh Adams to continue to be trusted more in the running game. However, look for short passes to be a big part of the game plan. The Eagles are heavy favorites in this game for a reason. If they lose, there's reason to be concerned about their prospects for the season. But I see them having a winning record by the end of the night. And for the first time all year, they'll have a winning streak.